The galaxy cluster 1E 0657-56 (known as the Bullet Cluster) lies 3.8 billion light-years away. It's one of hundreds that appear to be carried along by a mysterious cosmic flow. As if the mysteries of dark matter and dark energy weren't vexingenough, another baffling cosmic puzzle has been discovered. Patches of matter in the universe seem to be moving at veryhigh speeds and in a uniform direction that can't be explained by any of theknown gravitational forces in the observable universe. Astronomers are callingthe phenomenon "dark flow." The stuff that's pulling this matter must be outsidethe observable universe, researchers conclude. When scientists talk about the observableuniverse, they don't just mean as far out as the eye, or even the mostpowerful telescope, can see. In fact there's a fundamental limit to how much ofthe universe we could ever observe, no matter how advanced our visualinstruments. The universe is thought to have formed about 13.7 billion yearsago. 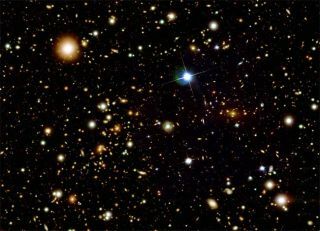 So even if light started travelling toward us immediately after the Big Bang,the farthest it could ever get is 13.7 billion light-years in distance. Theremay be parts of the universe that are farther away (we can't know how big thewhole universe is), but we can't see farther than light could travel over theentire age of the universe. Scientists discovered the flow by studying some of thelargest structures in the cosmos: giantclusters of galaxies. These clusters are conglomerations of about athousand galaxies, as well as very hot gas which emits X-rays. By observing theinteraction of the X-rays with the cosmic microwave background (CMB), which isleftover radiation from the Big Bang, scientists can study the movement ofclusters. The X-rays scatter photons in the CMB, shifting itstemperature in an effect known as the kinematic Sunyaev-Zel'dovich (SZ) effect.This effect had not been observed as a result of galaxy clusters before, but ateam of researchers led by Alexander Kashlinsky, an astrophysicist at NASA's Goddard Space Flight Center in Greenbelt, Md., found it when they studied a huge catalogue of700 clusters, reaching out up to 6 billion light-years, or half the universeaway. They compared this catalogue to the mapof the CMB taken by NASA's Wilkinson Microwave Anisotropy Probe (WMAP)satellite. They discovered that the clusters were moving nearly 2million mph (3.2 million kph) toward a region in the sky between theconstellations of Centaurus and Vela. This motion is different from the outwardexpansion of the universe (which is accelerated by the force called darkenergy). "We found a very significant velocity, and furthermore,this velocity does not decrease with distance, as far as we can measure,"Kashlinsky told SPACE.com. "The matter in the observable universejust cannot produce the flow we measure." The scientists deduced that whatever is driving themovements of the clusters must lie beyond the known universe. A theory called inflation posits that the universe we see isjust a small bubble of space-time that got rapidly expanded after the Big Bang.There could be other parts of the cosmos beyond this bubble that we cannot see. In these regions, space-time might be very different, andlikely doesn?t contain stars and galaxies (which only formed because of theparticular density pattern of mass in our bubble). It could include giant,massive structures much larger than anything in our own observable universe.These structures are what researchers suspect are tugging on the galaxyclusters, causing the dark flow. "The structures responsible for this motion have beenpushed so far away by inflation, I would guesstimate they may be hundreds ofbillions of light years away, that we cannot see even with the deepesttelescopes because the light emitted there could not have reached us in the ageof the universe," Kashlinsky said in a telephone interview. "Mostlikely to create such a coherent flow they would have to be some very strangestructures, maybe some warped space time. But this is just purespeculation." Though inflation theory forecasts many odd facets of thedistant universe, not many scientists predicted the dark flow. "It was greatly surprising to us and I suspect toeveryone else," Kashlinsky said. "For some particular models ofinflation you would expect these kinds of structures, and there were somesuggestions in the literature that were not taken seriously I think untilnow." The discovery could help scientists probe what happened tothe universe beforeinflation, and what's going on in those inaccessible realms we cannot see. The researchers detail their findings in the Oct. 20 issueof the journal Astrophysical Journal Letters.